During an interview with Power 105’s The Breakfast Club yesterday, Singer Jordin Spark, who split from Jason Derulo in July 2014, revealed that he broke up with her and never said a word to her again! She said she didn't even know they were officially broken up when he decided to call it quits. Jordin said after a big argument one day, Jason left the house they shared. She said she'd apologized to him before he left, so she assumed everything was fine. After she didn't hear from him for several hours, she called his phone but he never responded. She said she kept calling him but he never called back or contact her for a long time. Then she sent him a text and told him to get his things out of her house (he was living with her). She said he came and got his things and that was the last time she heard from him. About the car that Jason said he bought for her and wanted back, Jordin said she did get a BMW as a gift from him but later found out that he leased the vehicle. 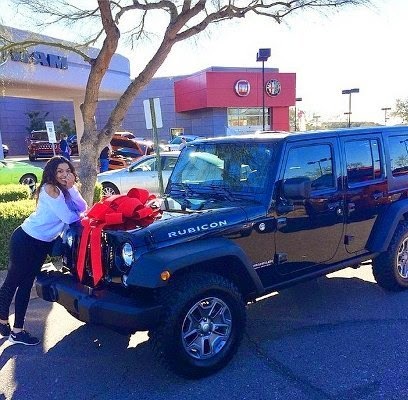 She said she took the car back to BMW dealership and bought herself a brand new Jeep for her birthday (which she showed off on Instagram - above). She said no hard feeling, she wishes him well and said he isn’t a bad guy.